Padre Pio was baptized with the name of Francis, and like the saint of Assisi, he received the stigmata, bearing in his body the marks of Christ’s Passion. He had many other mystical experiences throughout his life as well. “Those who went to San Giovanni Rotondo to attend his Mass, to seek his counsel or to confess to him, saw in him a living image of Christ suffering and risen,” affirmed Blessed Pope John Paul II. 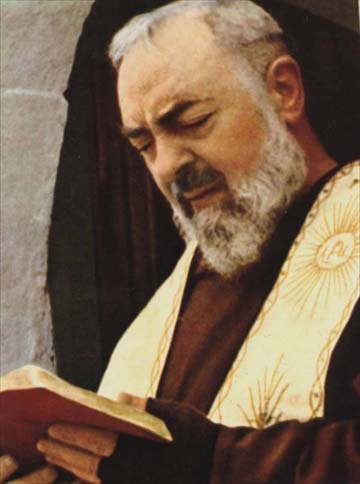 Given his reputation for sanctity, people would write to Padre Pio, asking for prayers, and many miraculous healings have been attributed to his intercession. He also established a hospital – the Home for the Relief of Suffering. By his teaching Padre Pio invites us to pray, to receive divine mercy through the sacrament of Penance and to love our neighbor.” He shows us the path to spiritual purification. Pilgrimages to holy places have been undertaken from the earliest days for a number of reasons, such as seeking divine assistance, in thanksgiving, as penance for sin, or for spiritual growth and devotion. As part of the Year of Faith, special pilgrimage sites have been designated throughout the Archdiocese of Washington. There the pilgrim is invited to meet the mystery of God and discover his merciful love. The grace of a plenary indulgence is also available during this Year. Even when we’ve been forgiven, the sins we committed have consequences, including what is called “temporal punishment.” As Pope John Paul II explains, this punishment “expresses the condition of suffering of those who, although reconciled with God, are still marked by those ‘remains’ of sin which do not leave them totally open to grace” and, among other things, weakens their ability in this life to resist temptation. So, to help the faithful, the Church opens the richness of her spiritual treasury by making available indulgences, which are the full or partial remission of that temporal punishment. This aids the repentant sinner to generous and radical conversion – a turning away from sin and toward God. Here we find ourselves again at the heart of the Paschal Mystery, dying in order to live. During the Year of Faith, a plenary indulgence is possible if in the course of a visit to a designated pilgrimage site a person who is truly repentant takes part in some sacred function or at least prays with devout attention, has received the Sacrament of Penance, assists at Mass and prays for the intention of Our Holy Father, the Pope. These prayers usually include the Our Father, a Profession of Faith and invocations to the Blessed Virgin Mary or the patron saint of the place. During the pilgrimage, we remember that we walk with our spiritual family, the Church, and with all the saints who have already completed the journey. They help us on our way, so that we, too, may someday enjoy with them the blessed vision of the glory of God forever. In this way, no longer wandering aimlessly in the desert, we advance in our ultimate pilgrimage toward the promised land of eternal life. We don’t travel alone. We walk with our spiritual family, the Church, with Padre Pio and the other saints who’ve already completed the journey. They help us on our way so that we too may enter into the blessed vision of the glory of God.